Patna Pirates skipper and star raider Pardeep Narwal created history becoming the first player in the Pro Kabaddi League's history to score 800 raid points. He achieved this milestone in tonight's match against the Puneri Paltan at the Rajiv Gandhi Indoor Stadium in Vizag. Pardeep Narwal started his Pro Kabaddi League career in the second season with the Bengaluru Bulls but was used as a substitute raider. He played only six matches and scored nine raid points before having his breakthrough season with the Patna Pirates the following year. 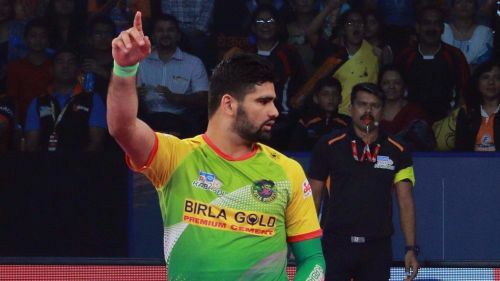 'Dubki King', as he has been dubbed popularly, Pardeep Narwal achieved a unique milestone as he went past the 800-point threshold in the Pro Kabaddi League becoming the first player to do so. Narwal managed to achieve this in the 81st match of his Pro Kabaddi League career. Narwal stood at 783 raid points before the start of the match against the Puneri Paltan in Vizag and produced a stunning performance to go past the record tally. He scored 27 raid points as the Patna Pirates defeated the Puneri Paltan with a huge margin of 17 points (53-36). Pardeep Narwal beat top raiders like Rahul Chaudhari (771), Ajay Thakur (697) and Deepak Niwas Hooda (629) to the 800-point tally playing one season less than his counterparts. For the past three seasons, he has been dominating the raiding tally finishing atop the season standings in Season 3 and Season 5. He has led the Patna Pirates to three consecutive PKL championship wins finishing as the Most Valuable Player (MVP) in the past two seasons. Narwal also holds the record for most points in a single season (369 - Season 5), the highest number of points in a single match (34) and even the most number of points in a single raid (8). Patna Pirates continue their quest for a fourth consecutive title as they currently sit on the second spot in Zone B of the standings this season so far.